I show this in Exhibit 5-3, which details FICO distributions for the three main parts of the nonagency market. The data are for deals originated in 2004. While there is some drift from year to year, the distributions for 2004 provide a good idea of how the loan characteristics are distributed in the different sectors. As shown in this exhibit, the jumbo sector has a distribution with the highest FICO scores. 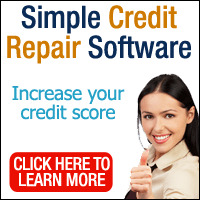 Not only are most of its scores greater than 675, but the lower cutoff point is roughly 600. The alt-A shelf has a similar lower cutoff point but contains fewer loans with FICO scores greater than 675 than the jumbo shelf. Because of this difference, one would expect to see higher default rates on alt-A deals than on jumbo deals, and in fact, this is exactly what one finds. Subprime has a distribution centered at around 600, with a longer tail to the right, that is, toward higher FICOs, than to the left. As we saw earlier, this leads to FICO averages of around 620 for subprime issuers. Exhibit 5-4, presents the distribution of LTV ratios for the three nonagency sectors. All the sectors show concentrations at 80% and 90% LTV ratio. However, jumbos have a much higher peak at 80% and a much lower peak at 90% than do either alt-A or subprime. 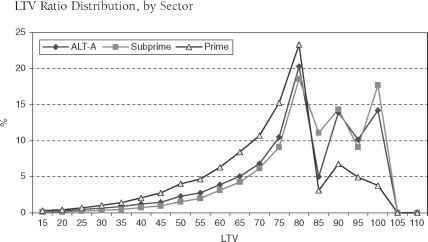 Subprime and alt-A have similar LTV ratio distributions, with subprime having a higher percentage in the above 80% buckets and a slightly lower percentage in the below 80% buckets. Clearly, these sectors are defined by their LTV ratios, as well as by their FICO scores, with the jumbo sector's stronger LTV ratios helping to create its superior credit performance. the agency conforming limit. However, note that in Exhibit 5-5 the jumbo size distribution has a bimodal distribution. adjustable-rate mortgage (ARM) jumbos. This exhibit highlights the difference between the two distributions. The fixed distribution is similar to the traditional shape of the jumbo size distribution, whereas the ARM distribution shows the high concentration of agency conforming loans. 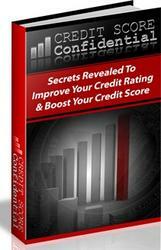 What is the fico cut off for a conforming mortgage?